Many quiltmakers like to make six inch quilt blocks in order to use a greater variety of blocks in a sampler style quilt. Another reason might be to test out the look of a block in a smaller size in order to save on the fabrics (just in case the block looks very different than in your imagination). Whatever your reason for creating six inch blocks, the pieces are all just smaller versions of larger sized quilt blocks -- such as the most popular size, the 12" quilt block. This is what makes quiltmaking so exciting -- you are the designer and get to choose all the components. The Goose Tracks quilt block focuses on the half square triangle patch as the main "ingredient" and then throws in a few squares in different sizes for good measure. This is a good starter block for the beginner quilter. Simple shapes can make for very intriguing quilts and there is no limit to the ways you can use this quilt block in your final production. 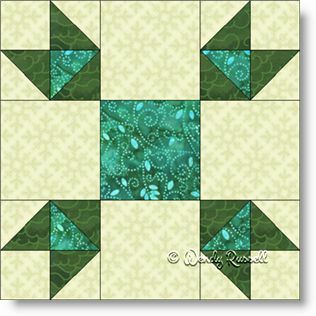 This nine patch quilt block also makes a great scrappy block allowing you to use up your scraps. The only criteria is to make sure that each half square triangle unit has a definite "dark" and "light" fabric for effective contrast. The sample quilts illustrated show you layouts using the additional sashing between the blocks for greater emphasis.